Station Casinos’ Sante Fe Station opened its newly upgraded bingo hall at the end of November. 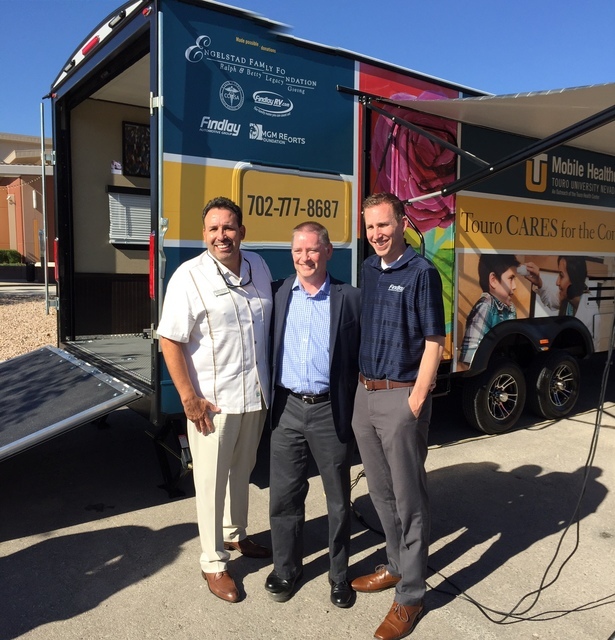 COURTESY Findlay Automotive CFO Tyler Corder, center, is flanked by Findlay RV general manager Reuben Figueroa, left, and E-commerce Director Jeff Giles at the unveiling of the second Touro University Nevada Mobile Health Care Clinic. The new 10,000-square-foot hall, which occupies space that had been the Revolver country nightclub and bar, features 30 television screens, a 12-by-15-foot video wall and universal serial bus charge ports, where guests can plug in while playing bingo. The room can seat up to 350 players. Station Casinos launched bingo in its first property, Bingo Palace, now Palace Station, in the mid-1970s. The new hall’s cost wasn’t disclosed. The Henderson Chamber of Commerce and Henderson’s Economic Development and Tourism department recognized businesses for their positive impact on local growth during the 17th Annual Economic Development and Small Business Awards. The event, held Nov. 10 at Green Valley Ranch Resort, recognized several organizations, across several categories. Barbra Coffee, economic development and tourism director for Henderson’s Economic Development and Tourism department, presented the economic development awards. Scott Muelrath, president and CEO of Henderson Chamber of Commerce, presented the chamber’s small-business awards. Economic Development Project of the Year Award went to San Francisco-based Prologis; Expansion Project of the Year went to Nevada State College; Lovelady Brewing Co. won Redevelopment Project of the Year; Private Sector Person of the Year Award went to Raintree Investment Corp. Executive Vice President Cody Winterton; and O’ Callaghan Public Sector Person of the Year Award went to Jeff Leake, retired economic development manager for Henderson’s Economic Development and Tourism department. The Henderson Chamber of Commerce recognized 10 local businesses: BounceU received the All In the Family Award; School of Rock Green Valley was given the Business On the Rise Award; the Customer Service Award went to Trish Nash Signature Gallery of Homes; the Green Award, presented by Republic Services, went to Tate Snyder Kimsey Architects; the Innovation Award went to LT Proactive Clinic — Dr. Ryon Parker. Galleria at Sunset received the Outstanding Community Service Award; Miracle Flights received the Outstanding Nonprofit Award; Stan Olsen of Olsen Strategic Group received the Noble Award, presented by Laird Noble Sanders; Susan Smith of LegalShield was named Ambassador of the Year; Board Member of the Year Award went to Emerald Island Casino’s Tim Brooks. MGM Growth Properties LLC, a real estate investment trust owning several MGM Resorts International Strip properties, said in November that it was added to the MSCI U.S. REIT Index — a free float-adjusted market capitalization index composed of equity REITs. The index represents about 99 percent of the U.S. REIT universe — excluding mortgage and specialized REITs. Sundance Helicopters has partnered with the Clark County School District to offer complimentary tours of Grand Canyon West to CCSD students and teachers as part of Sundance Helicopters’ initiative to support and give back to the community it has called home for more than 30 years. The CCSD/Sundance Helicopters field trips will begin in November and continue throughout the academic school year. For this full-day adventure, 29 Southwest Career and Technical Academy students will be transported by bus between Las Vegas and Grand Canyon West. CCSD teachers wanting to participate must apply by creating lesson plans focused on Nevada Academic Content Standards. A committee of district leaders will help select the applications that best address CCSD curriculum and standards. 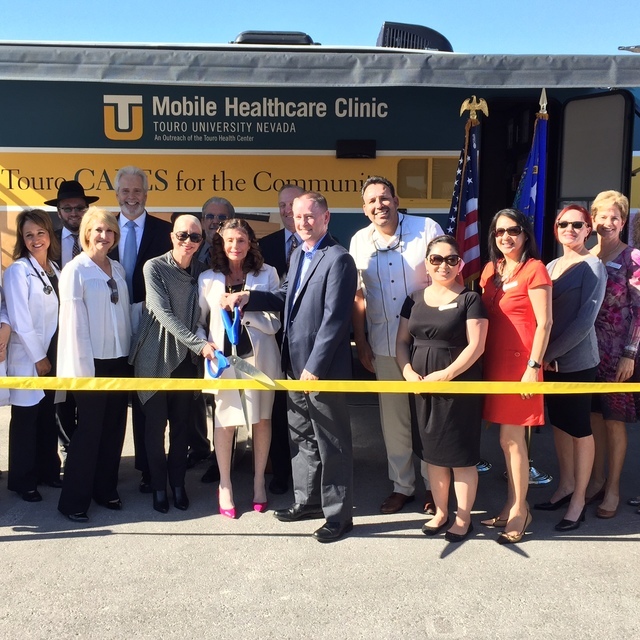 Window Genie opened its newest location in east Las Vegas on Nov. 28. Brad Stegman is the owner. Window Genie opened its first Vegas location in October on the west side of town. Window Genie is a national home service franchise specializing in residential and light commercial window cleaning, window tinting, pressure washing, gutter cleaning and more. Window Genie will serve the Henderson and east Las Vegas areas.